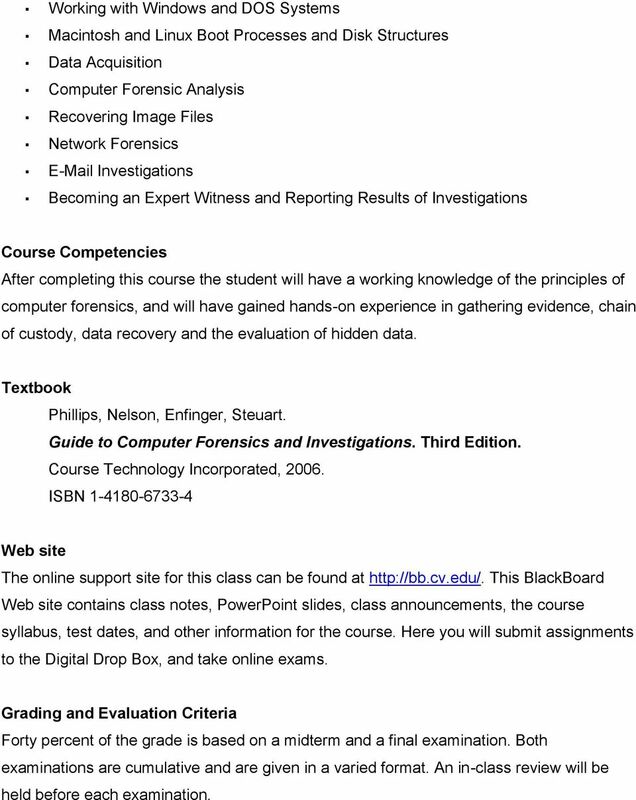 Download "Computer Forensics (3 credit hours)"
2 Working with Windows and DOS Systems Macintosh and Linux Boot Processes and Disk Structures Data Acquisition Computer Forensic Analysis Recovering Image Files Network Forensics Investigations Becoming an Expert Witness and Reporting Results of Investigations Course Competencies After completing this course the student will have a working knowledge of the principles of computer forensics, and will have gained hands-on experience in gathering evidence, chain of custody, data recovery and the evaluation of hidden data. Textbook Phillips, Nelson, Enfinger, Steuart. Guide to Computer Forensics and Investigations. Third Edition. 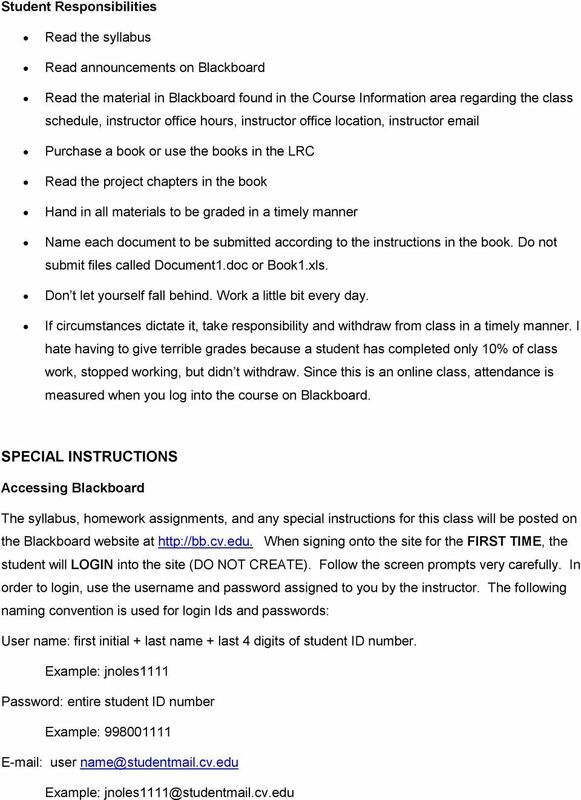 Course Technology Incorporated, ISBN Web site The online support site for this class can be found at This BlackBoard Web site contains class notes, PowerPoint slides, class announcements, the course syllabus, test dates, and other information for the course. Here you will submit assignments to the Digital Drop Box, and take online exams. Grading and Evaluation Criteria Forty percent of the grade is based on a midterm and a final examination. Both examinations are cumulative and are given in a varied format. An in-class review will be held before each examination. 5 Accessing Student Mail Server For a student to access his/her mail located on the CVCC mail server, use the procedures below: Login onto bb.cv.edu Click on the studentmail.cv.edu (at the top of the screen) Enter username (same as Blackboard user name) Enter password (student ID # number) Absence Policy Logging into Blackboard and submitting assignments is our class participation. Take advantage of the online content, try the practice quizzes, and watch for Announcements posted by the instructor. 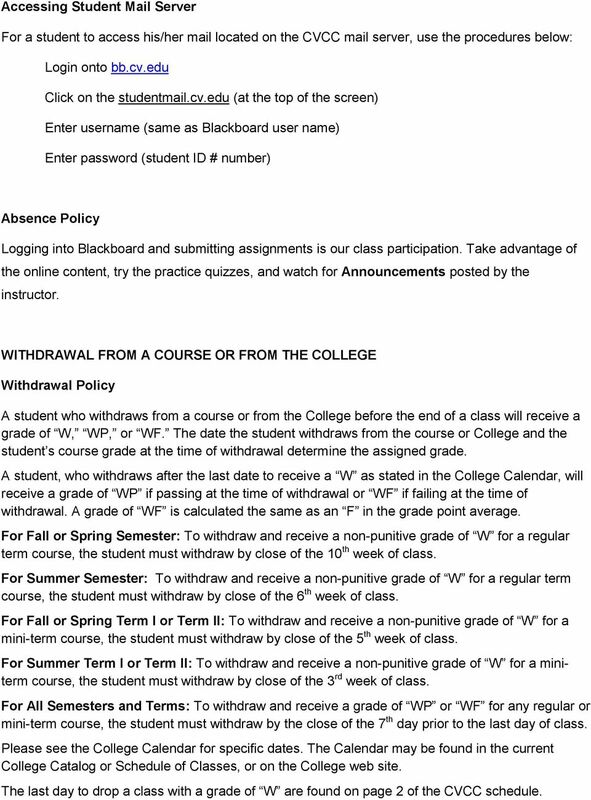 WITHDRAWAL FROM A COURSE OR FROM THE COLLEGE Withdrawal Policy A student who withdraws from a course or from the College before the end of a class will receive a grade of W, WP, or WF. The date the student withdraws from the course or College and the student s course grade at the time of withdrawal determine the assigned grade. A student, who withdraws after the last date to receive a W as stated in the College Calendar, will receive a grade of WP if passing at the time of withdrawal or WF if failing at the time of withdrawal. A grade of WF is calculated the same as an F in the grade point average. For Fall or Spring Semester: To withdraw and receive a non-punitive grade of W for a regular term course, the student must withdraw by close of the 10 th week of class. 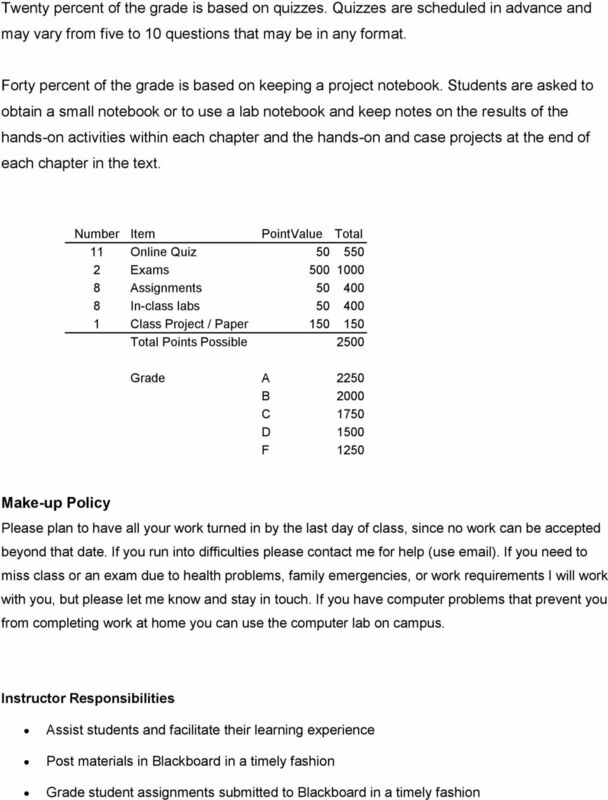 For Summer Semester: To withdraw and receive a non-punitive grade of W for a regular term course, the student must withdraw by close of the 6 th week of class. For Fall or Spring Term I or Term II: To withdraw and receive a non-punitive grade of W for a mini-term course, the student must withdraw by close of the 5 th week of class. For Summer Term I or Term II: To withdraw and receive a non-punitive grade of W for a miniterm course, the student must withdraw by close of the 3 rd week of class. For All Semesters and Terms: To withdraw and receive a grade of WP or WF for any regular or mini-term course, the student must withdraw by the close of the 7 th day prior to the last day of class. Please see the College Calendar for specific dates. The Calendar may be found in the current College Catalog or Schedule of Classes, or on the College web site. 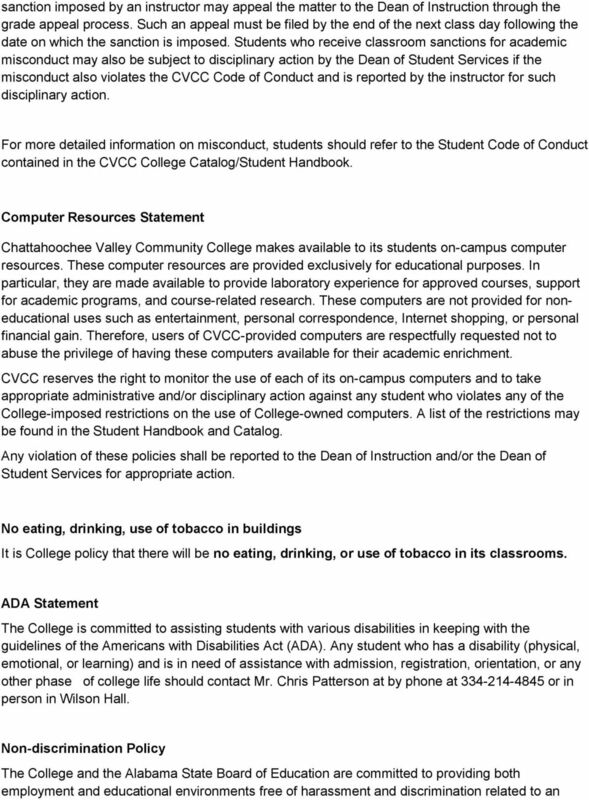 The last day to drop a class with a grade of W are found on page 2 of the CVCC schedule. STA2023 Introduction to Statistics Spring 2013. Class Website: http://www.hccfl.edu/faculty-info/jdenson3/sta2023-introduction-to-statistics. 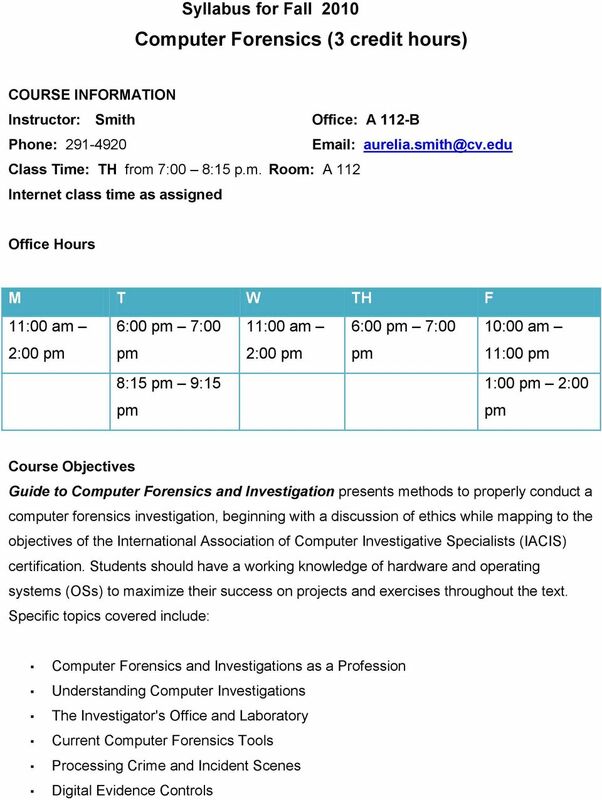 ITSY-2459-8001 Security Assessment/Auditing Spring 2010 Professor: Zoltan Szabo D111 LEC TR 11:20AM 12:45PM D111 LAB TR 12:50PM 02:15PM CATALOG DESCRIPTION: Capstone experience for the security curriculum. Course Title: Introduction Civil Engineering Lab Fall 2015 Course Prefix: CVEG Course No. : 1021 Section No. P01 Department of Civil & Environmental Engineering College of Engineering Instructor Name: Dr.